November | 2014 | cut it out, stitch it up! After the success of the ponte roma lady skater dress I ordered more ponte fabric to make a skirt. The plan was to make a skirt to wear with the bird print shirt which so far has only been worn once as I felt I didn’t have the right thing to wear with I but I’m not sure I’ve successfully fulfilled my brief. 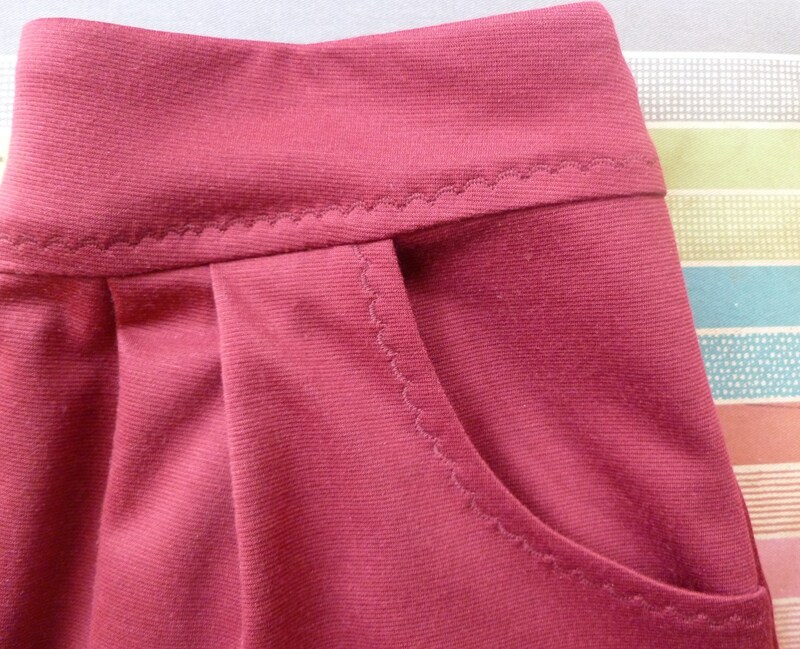 When I ordered the fabric I shyed away from getting a bright red and played safe and went for a wine colour. The fabric was from The Textile Centre on e-Bay at £3.49 per metre. I really liked the fabric when it arrived, it has lovely drape but it’s a funny thing. When I’m looking at the fabric and finished skirt I like it but when I’m thinking about it I think it looks a bit cheap and synthetic, so I go back and take a look and realise it looks fine. Does anybody else get those doubts about fabrics? I used a self drafted pattern that I made earlier this year for this denim skirt. It’s quite a simple draft which I wrote about in this post. The denim version of this skirt has had loads of wear since it has been made. The pattern works fine for both wovens and knits but I did find the ponte roma gave a lot more bulk around the pocket bags and the top of the pleats. I didn’t think that this fabric was going give a nice top stitch so I tried a decorative stitch using a tonal thread and was pleasantly pleased with the results. I used this for the pocket openings and the lower edge of the waistband. 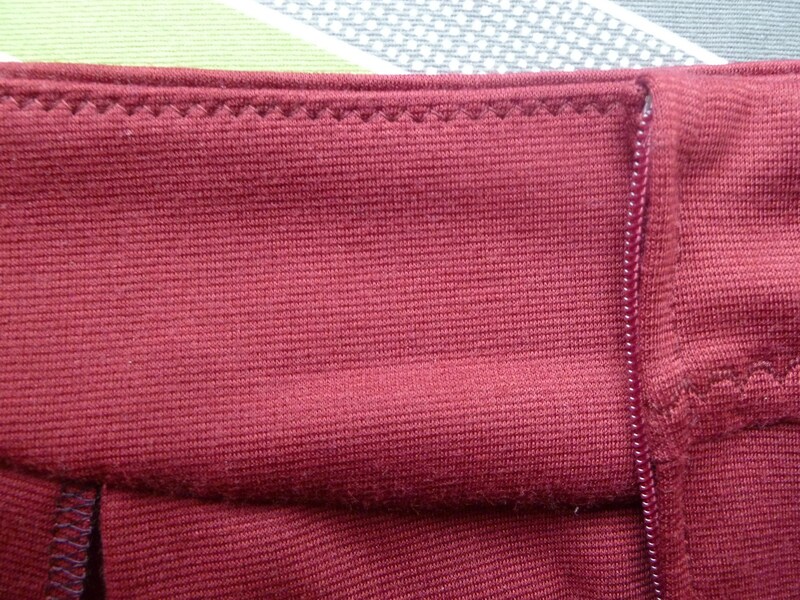 I thought adding to the top edge of the waistband would be too much so after pressing the seam allowance I understitched it with a zig zag stitch. 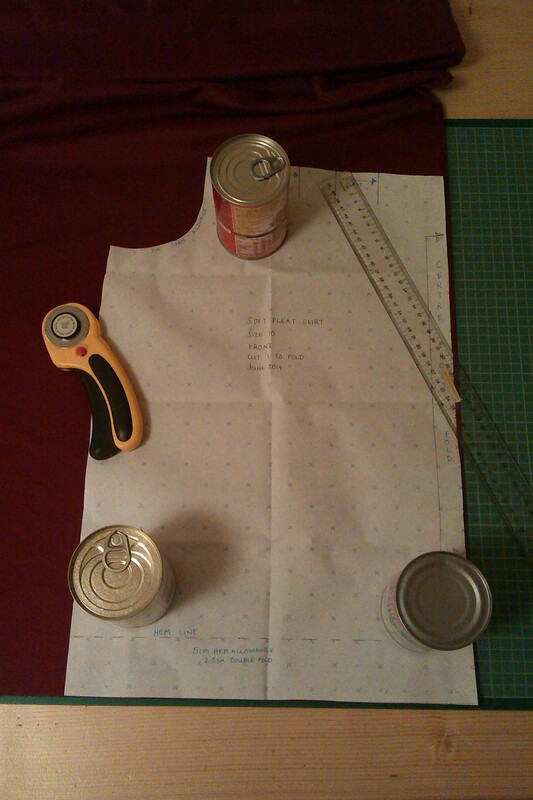 I didn’t have an invisible zipper to hand so I used a normal zipper and ‘double lapped’ it , if that’s the term. I did this by sewing the seam where the zipper would be with the biggest straight stitch, then pinned the zipper in place and stitched it in then unpicked the stitches from the seam. I was a bit unsure how to handle the waistband, I used knit interfacing on one side but on the other to prevent too much stretch I used a narrow strip of normal fusible interfacing along the seam line. The vertical seams were sewn with a standard straight stitch and I used the stretch stitch for the horizontal waistband seams and all using a ball point needle. 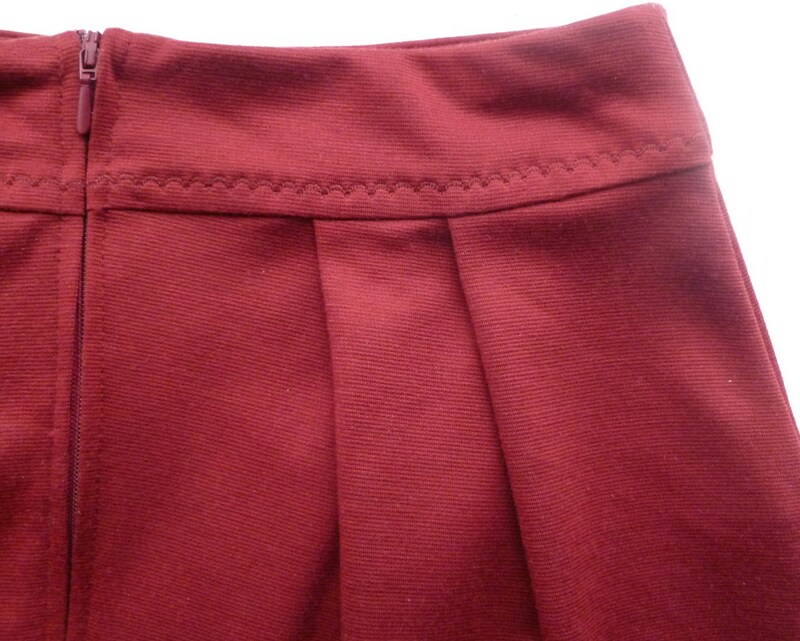 I overlocked the bottom edge of the skirt and hand stitched up a 2.5cm deep hem. But I need to do it again. When I was taking photos I took one of the back view and it was only then I noticed the centre back hem was about 2cm shorter than the front. So, I need to unpick and even the hem off properly this time. It’s not too much of a disaster but I will have to loose a little bit of length from the front. That’s what you get for rushing the hem and being too gung ho with the scissors. 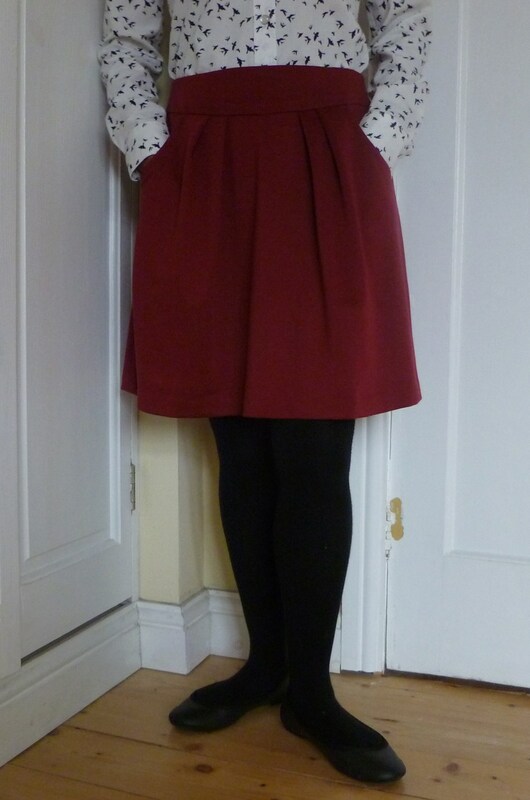 back of the skirt – without showing the terrible hem issue! Looking at the photos of the skirt it looks much better than I think it does. As I say though, I’m not sure if I’ve made the perfect garment to accompany the shirt. But hey! I now have a rotary cutter and A1 sized self healing mat and this was the first time I used them. I also managed to draw blood the first time I used it, only a tiny nick, that blade is really sharp! When I made my first Kitschy Coo Lady Skater dress back in the summer I raved about it. I just loved the styling and the fit. So there had to be long sleeved winter version and it came to me to add the cowl neckline from the Sewaholic Renfrew. I love this dress just as much, or even more than my summer version. 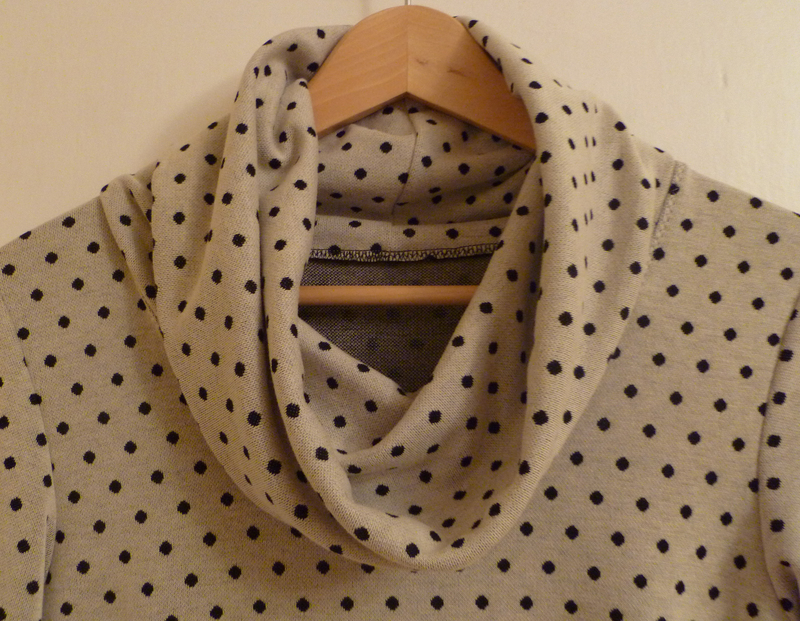 The fabric is from Plush Addict, a polka dot ponte Roma. £9.50 per metre and I used 2mts for this dress. The fibre content is 75% polyester, 20% viscose and 5% spandex. This is the first time I have used a ponte roma fabric and I really enjoyed sewing with it and no bother to cut out. To add the Sewaholic cowl you need to adjust the front and back bodice pattern pieces from the lady skater. The Renfrew has longer shoulders fitting closer to the neck and the back neck drop (the scoop of the back neck) is shallower. I placed my lady skater bodice pattern on the fabric and laid the Renfrew bodice on top – I matched the centre front seam and outer shoulder point and you’ll notice that the depth of the scoop neck is the same on each pattern. I chalked in the extra shoulder length and chalked in the sides of the neck scoop and back neck drop as necessary. I cut the cowl all in one as I did on the Renfrew Cowl neck top, it’s a massive pattern piece and I only just managed to fit it into my fabric layout. I added an extra inch to the skirt length, which now looking at the photo, I don’t think was necessary but it doesn’t trouble me enough to shorten the skirt. I used my standard machine for attaching the clear elastic at the shoulders and waistline (I do this with a zig zag stitch and using a Teflon foot have no problems) and also for attaching the skirt pieces to the front and back bodice, using a stretch stitch and ball point needle. 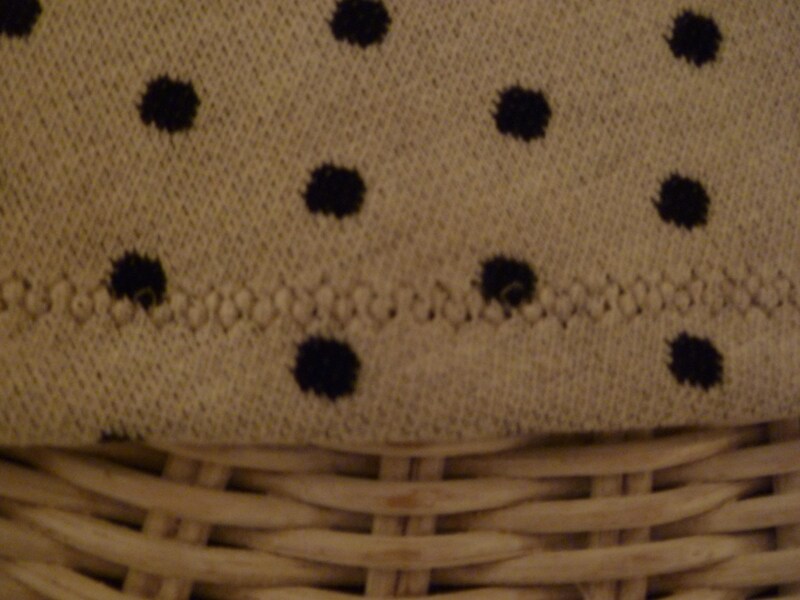 I also used it for the zig-zag topstitching around the neck line. All other seams were sewn on the 4 thread overlocker which makes it a really quick job. I fell out of love with using the twin needle for the hem a while back and have since found other stretch stitches on the machine which do the job just as well or even better. This stitch took an age to sew around the hem but looks good. This dress is a definite success and I can see it getting lots of wear over the winter. I’m still going to rave about the Kitschy Coo Lady Skater dress as I think it is such a great pattern.